Simplicity, thoughtful design, and high-definition performance. The Astronaut speaker and Orbiter wireless pendant microphone—the alternative choice to ordinary, complex, and expensive in-ceiling speaker and IR microphone systems. 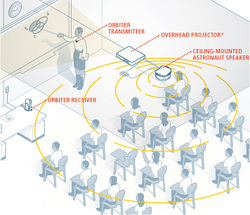 The Astronaut and Orbiter are a complete classroom voice and multimedia amplification system. As the only system for the education market with omni-directional sound, the Astronaut and Orbiter achieve the equivalent sound of a 4 in-ceiling speaker and microphone system with only one powered speaker, no light sensors, and significantly less cabling. Just mount the Astronaut to the ceiling with the included ceiling bracket, plug in the Orbiter receiver, and turn on the pendant microphone. That's it—simple! *Connect up to 3 source devices simultaneously: projectors, computers, interactive whiteboards, microphones, DVD's, and iPod's. A teacher microphone should be anything but complicated. It should be intuitive. It should turn on every day at the perfect volume with no surprises. It should wear comfortably and naturally. There should be no batteries to replace—ever. Accomplishing just this is the Orbiter, the first HD wireless pendant microphone for education. Set the volume and it automatically saves into memory so that every day it turns on at the perfect volume. Click just one button for ON, OFF, and MUTE. Charge it intuitively like you would your cell phone. And, at a mere 2.5 ounces, it will wear all-day long without strain—as if it wasn't even there. Whether live, amplified, or pre-recorded, the voice is the method of communication that initiates and inspires student learning. It is imperative that it is heard and understood clearly by all students equally. By this authority, Cetacea Sound seeks perfect vocal reproduction in all of its audio designs. The Astronaut, with its patented 360-degree omni-directional sound, is better for group listening because it eliminates off-axis distortion (uneven frequency balance). Each student hears optimal vocals no matter where they are seated. Custom, audiophile-grade componentry and pre-equalization further enhance the Astronaut's distinctively clear vocal performance. The Orbiter on the other hand, matches the Astronaut's perfect vocal amplification with perfect voice transmission. It challenges ordinary wireless microphone designs by introducing a first to market, state-of-the-art HD radio transceiver. A plug-n-play design, it simply plugs in with little installation required. No dropouts. No static or hiss. No light sensors. Simply turn it on and talk with perfect vocal clarity.